I am personally and professionally thrilled to share with you a guest post written by Sunnyside Micro-School’s educational therapist, Cindy Miner. Cindy offers years of experience in education working with bright and exceptional learners in Bay Area schools and learning programs including public, private, and nonprofit settings. With a home-based practice in Alameda, California, Cindy meets K-8th grade learners one-to-one and small groups. She also supports and collaborates on student success teams at schools. Schools have hired her on request to share her knowledge and practices for development presentations to teachers and parents. Cindy, thank you so much for being an inspiring member of the Sunnyside community! Cindy and I will be hosting a webinar to discuss more about her work with Sunnyside Monday, August 20th at 1 pm PST. Follow this link to learn more and register. Hope to see you there! window, and focus on a place of connection, because they have no choice. “learning frameworks” because they offer a structure to make the invisible, visible. knowledge in specific areas. These learners are bright, intellectual, active, and curious. Frameworks are taught with direct instruction. After enough practice, they become a habit. and demonstration, letting them do more and listen less. means for decoding practice with direct instruction on word parts. The strategy is straightforward, allowing a student to feel competent and capable using it. Even if the material is complex, it can be less daunting when packaged in an approachable, inviting, or familiar way. All of my learners need a sense of “I can do that…” to enter into the task. Frameworks provide a welcome mat for a safe entry to taking a learning risk. out, so that they can advocate for themselves and know how they learn best. learning to light up and make an imprint. for the learner’s interests and abilities boosts a chance for success. with that learner became their own. 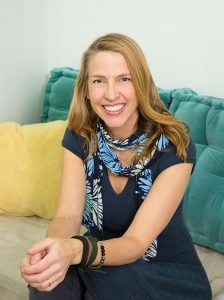 You can learn more about Cindy and her amazing work on her website Learning Frameworks. And don’t forget to sign up for our webinar Monday, August 20th at 1 pm PST. Cindy will be sharing more insights and answering all your questions about using learning frameworks with gifted and twice-exceptional children. I’m delighted to share with you a guest post written by Sunnyside Micro-School’s documentation specialist and art teacher, Melissa Stepien. Melissa is an educator with a strong creative/visual arts background and extensive experience integrating pedagogical philosophies that support progressive learning modalities. She views the art of teaching as a journey based on reflection, reciprocity, and relationship and values her role as a protagonist with students engaged in meaningful inquiry. Thank you for such a soulful and inspiring post, Melissa! The stage is set: large sheets of blank paper, varied complementing and contrasting materials of color and texture, paints and scissors. Every Thursday afternoon at Sunnyside MicroSchool, visual art opportunities are designed and offered as a means for self-exploration and understanding. Creativity in traditional art endeavors is generally equated with its results. A process based approach throws away the map, there is no direction or goal; specific expectations and rules are replaced with a sense of adventure. I invite my students to inhabit and explore their present states of reality with playful spontaneity. Of course, it can be challenging for asynchronous children to navigate such an open-ended proposition. Perfectionism and self-doubt can be formidable obstacles for our resident artists, and yet I’ve found that the strength of resistance or aversion usually indicates something waiting to emerge. It is at these times that I might offer an idea prompt or scaffold an existing thought process in a way that lends encouragement without it being an obvious teacher directive. Then again, sometimes a simple “try to keep going” can be enough to get them past a wall. I am delighted when I see my students engage with the process, exploring emotions or taking risks they may not generally allow themselves to take. Recently we had a table full of laughter and fun as each child made an expressive choice that revealed an aspect of a shining self. Want to learn more about the culture we’re building at Sunnyside Micro-School? Sign up to learn more here.